The Ultimate Ears (UE) division of Logitech has been making some of the best Bluetooth speakers out there for quite some time. When I reviewed the waterproof UE Roll last year, it became the no-brainer summer music purchase, especially as 9to5toys caught it dipping down to $50 a few times in the past few weeks. The UE Roll is super-portable, mostly flat, rugged and so waterproof you can bring it into a pool with its own little floatie. The sound quality is amazng for the small form factor and the battery lasts between 5-10 hours. This is the speaker I take with me on most trips because it is small in the backpack yet still sounds great, pairs easily with multiple devices and even has iOS/Android apps for creating alarms and checking battery. Obviously if you are throwing a house/pool party, you’ll want something more substantial like UE Boom and Megaboom. Blasts out 15 percent more sound, delivering epic tunes in the palm of your hand. I’m not going to blow smoke … and say that this is a big upgrade. It isn’t. 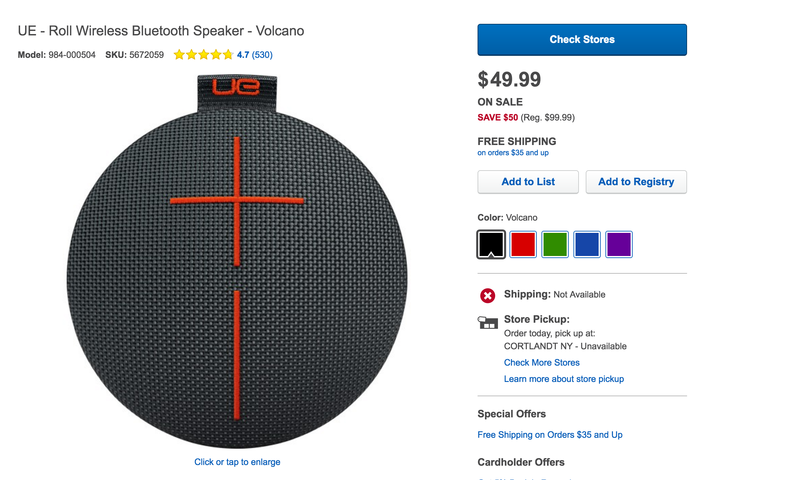 In fact, at at least a $30 premium over the original UE Roll, I’m going to do something I rarely ever do – recommend you buy the old model for $30 less at Amazon (Verizon and Best Buy too). You really won’t notice any difference and that $30 bucks you save can go almost halfway into purchasing another original UE Roll to pair up for stereo sound (for 200% the sound). It has been a solid year and a half since our last Big “Best Portable Bluetooth speaker” competition, though we’ve done tons of updates to it in the months since. Logitech’s UE brand is often at the top of our list when it comes to the best bluetooth speakers around, so we’re excited that today the company introduced its latest product with the announcement of the ‘UE BOOM’. Logitech is calling this “the world’s first social music player,” and that’s due to the fact that it’s the first to offer 360-degree sound and a 15-hour rechargeable battery. That’s a nice step up from the 5-8 hours you’ll get with most Bluetooth speakers.